This week I take a look at the most popular models of home brewing pumps: the March Pump and the Chugger Pump. Next week in part 2 I will cover the new Blichmann RipTide pump which has some significant advantages over the traditional brewing pump. In the last 10 years, larger stainless beer brewing systems have become popular and affordable for serious home brewers. As brewers transition from 5 gal (19 liter) batches to 10 gal (38 l) or larger batch sizes, it becomes impractical and somewhat dangerous to be lifting and pouring pots of hot wort weighing 100 pounds (42 kg) or more. For this reason, brewing pumps have become an integral feature of most high end home brewing systems, with many three-tier systems featuring two pumps to manage recirculation, chilling and transfers. Two companies dominate the current home brewing pump market: March and Chugger pumps, and Blichmann Engineering has just launched a new entry with some innovative features called the RipTide pump which I will cover in detail in part 2. The March and Chugger pumps have similar size and features and in fact they are largely parts-compatible in that parts can be exchanged between similar models. The Blichmann pump is a completely new design, but has some very nice features that make it quiet, easy to clean and easy to prime. I’ll also briefly cover diaphragm pumps which are for low temperature transfers, and unfortunately not well suited to general brewing applications. The standard brewing pump for many years now has been the March series of pumps. The original standard was the 809 pump but the current (most popular) model is the March 815 model. Its a high temperature pump to handle boiling water that moves approximately 7 gallons/minute. It has a magnetic drive head which allows it to handle lower flow rates, and most often a ball valve is fastened to the output so you can vary the flow of wort. The pump comes in both plastic and stainless steel head versions, and you can in fact remove the head by removing four screws to either clean it or replace it. Some brewers prefer the stainless steel head which can be easier to clean and sanitize. The standard model has 1/2″ MPT connectors on the inlet and outlet. The pump currently retails for around $180 and a bit more for the stainless version. The pump is not self-priming, which means you need to have some way to fill the pump with wort or water before use. Most brewers do this by adding a small bleed valve on the inlet side so enough wort/water is in the tube to prime the pump on startup. It can be very difficult to prime the pump without the extra bleed valve. 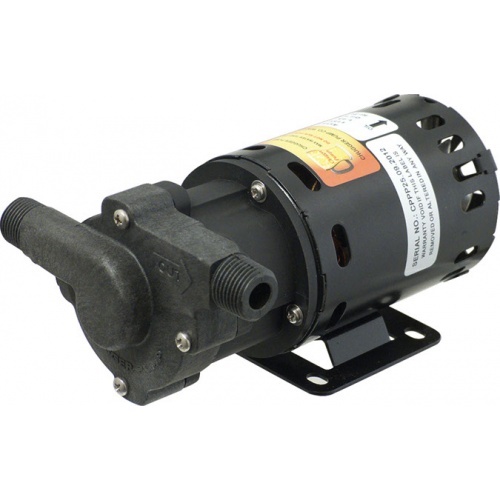 March pumps are typically very reliable and reasonably affordable. Their main limitations are in needing to disassemble the pump to fully clean it and also the fact that they are not self-priming. 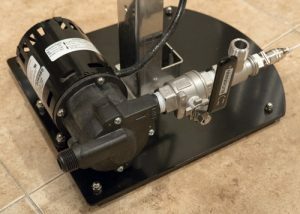 Chugger pumps entered the market several years back featuring a less expensive “near-clone” of the March pump. Their mainline “chugger pump” model has almost identical specs as the March 815, including a 7 gal/min pump rate, same power, 1/2″ MPT inlet and outlet connectors and two models featuring both the plastic and stainless steel magnetic drive head. The heads on the March and Chugger pumps are interchangeable, and in fact you can order a separate stainless steel head from Chugger if you want to convert a plastic head March or Chugger pump into a stainless head model. As I mentioned the chugger pump is functionally identical to the March pump, so it is not a self-priming pump. Most brewers add a ball valve to the output to control flow and also a bleed valve on the input to assist in priming the pump. Chugger pumps have the same advantages/disadvantages as the March pump. They also have a good reputation with brewers, and a lower price point, currently selling around $120 for the plastic head version and $150-160 for the stainless steel head version. In addition to the high temperature magnetic drive pumps, you can also find various models of self-priming diaphragm pumps. These have the advantage of being self priming so you don’t need to add a bleed valve or pre-fill the tubes and pump with wort before use. Unfortunately most are limited to roughly 130 F (54 C) in operating temperature which means you can’t use them to transfer boiling hot wort or even circulating mash water when brewing. This limits them effectively to transferring already cooled wort or beer when moving between fermenters for instance. As a result I don’t recommend these pumps for general purpose brewing use. 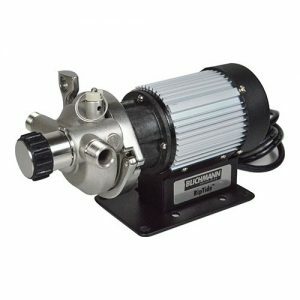 Blichmann just released a new home brewing pump called the RipTide. I was fortunate enough to brew with one recently and will share with you next week in part 2 why this pump has some advantages over the traditional March/Chugger pump design.